Author Jennie Jones re-ignites the magic writing in this instalment in the Rangelands series. I was mesmerised by Ms Jones’s earlier book series, the Swallow’s Fall, and A Place With Heart contained traces of that magic, which as anyone who has read my reviews on that series would know, is a complete drawcard for this reader. Loveable characters, a country backdrop, laughter, emotions and drama! What a top pick for reading A Place With Heart is! Jax and Jack shine in the read. The townsfolk are equally memorable characters to read about, especially the Agatha Girls whom stole the show at every mention. Laugh out loud moments mixed with elements of drama, comedic and emotional moments all combined to make A Place With Heart by author Jennie Jones an unmissable read. A Place with Heart is book two in the Rangelands Series by Jennie Jones. Senior Sergeant Jack Maxwell came to Mt Maria too relief Senior Sergeant Luke Weston for six weeks. However, no one knew that he was there to look into drugs trafficking. Isabelle Jaxine Brown run the local cafe and a farm looking after rescue animals. The readers of a Place with Heart will see if Jack and Jax will reunite their blossoming romance and became involved with the Senior Sergeant Jack Maxwell investigation into drug trafficking. I enjoyed reading A Place with Heart. I like Jennie Jones portrayal of her characters and the way she intertwines them with each other. A Place With Heart is well written and researched by Jennie Jones. I loved Jennie Jones descriptions of her settings and the plot of A Place With Heart. The Rangelands series is fantastic and enjoyable series by Jennie Jones, and I have read both books in this series, and I found them excellent. I will differently re-read A Place with Heart due to that fact that Jennie Jones knows how to ensured that I was engaged in the plot from the beginning. The readers of A Place with Heart will learn about law enforcement procedures in stopping people of interest on the highways. Also, the readers of A Place with Heart will see the problems rural communities have in receiving assistance during emergency situations. I highly recommend this book. There are some lovely lines in this - as you always get with Jennie's books, and I highly recommend it to lovers of Australian romantic suspense and rural romance. 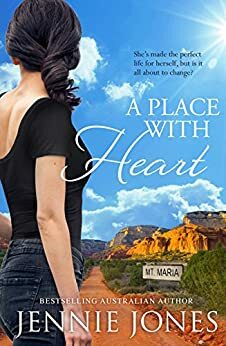 Thanks to Harlequin Mira and Beauty & Lace book club I had the opportunity to read A Place With Heart by Jennie Jones in exchange for an honest review. I must admit that this book left me feeling cold. I normally love this genre but something was missing for me. It just didn't feel authentic. I felt that the characters were alright but a bit bland and never really developed. There were some great topics such as dementia, abuse and dysfunctional families/the fostering system that the author could have delved into further but, instead, chose the safe path of only skirting around these issues. Although this book didn't engage me, I can see by the other reviews that I'm definitely in the minority so it might suit other people. 5.0 out of 5 starsA good read with happy ending. Enjoyed the story of Jax and the challenges she faced. The author draws you in and makes it hard to put the book down. This story is so good, there is a lot happening in this one it is sure to keep you turning the pages as it did me, it is book two in a series I have book one waiting for me and now very much need to read it although this one can be read as a standalone and I do highly recommend it. This is the story of three fabulous people Jaxine Brown café owner and lover of animals, and Detective Senior Sergeant Jack Maxwell want to be lover of Jax and Frances thirteen year old daughter of Jax who has just arrived in the small outback town of Mt Maria to start a new life with a lot of issues to sort out. Make yourself comfortable for this one I loved it. Jaxine is doing well in MT Maria she loves her café and the animals that she cares for but life for Jax is about to change when the daughter that she had at seventeen and was coerced into giving up has now arrived to live with her, Frances has been through a lot in her short life and is not very trusting to begin with and then to have Jack Maxwell the one man that Jax thought something of a year ago has arrived in town as well to take over the being in charge of the police station, Jax is in for a journey and a half. Jack has arrive doing undercover work chasing drug traffickers and he also wants to talk to Jax the woman that he has never forgotten and this time he is determined to explain what happened a year ago because he wants her so badly she is the place in his heart, but of course things never run smoothly where true love is concerned firstly her beautiful daughter Frances arrives and there is vandalism and animal stealing going on and danger is just around the corner. This is a fast paced story that has everything that a romance reader would want in a story there is lots of action from criminals and the police and you are sure to be smiling with the Agatha Sisters and the help they offer the community but of course there is the romance and what a beautiful romance it is Jack is so very determined to win Jax and Frances over and to see them all so happy in the end is awesome. MS Jones has written a story that will stay with me for a while fabulous characters that add so much to the story not to mention the array of animals that you will also fall in love with. Thank you MS Jones for a fantastic story, it is moving, emotional and beautiful and one that should not be missed. 5.0 out of 5 starsA gritty, intense romantic suspense novel! When her daughter Franca - Frances - arrived, she was surly, didn't want to be there and scared Jax Brown half to death. Jax had been "persuaded" to hand her baby to the child's father when she was a naive seventeen year old. She had been told to keep out of her life, and though heartbroken, Jax had done as asked, thinking it was in Frances' best interests. But now the poor child - thirteen years old - was no longer wanted by her father and step-mother. What a terrible young life she had had. Detective Senior Sergeant Jack Maxwell had recently arrived back in Mt Maria, and taken over the position of Officer In Charge while the current OIC - Senior Sergeant Luke Weston - was on leave. But Jack had an ulterior motive - one no one else was to know about. Jack's thoughts were that the undercover operation shouldn't take too long to resolve; in the meantime he was keen to rekindle the friendship he'd formed with Jax when last in town. As usual, the best laid plans were bound to go wrong - and in spectacular fashion they did. When Jax began noticing vandalism on her property, she thought it was "just kids" - but the escalation was mind-boggling. Would Jack find the answers before anyone was hurt? Could he flush out the bad guys in Mt Maria? A Place With Heart is the second in the Rangelands Series by Aussie author Jennie Jones, and it proved to be a gritty, fast-paced and tension-filled suspense novel that held me in its grip until the end! Set in rural outback Western Australia, the romance is light while the suspense is just as I like it - it made my heart race! I thoroughly enjoyed the first in the series (A Place to Stay), and this one didn't disappoint. Highly recommended.